A disk issued last month by the human rights organization Memorial shows documental archives and records of 44,500 people who were on “Stalin's Shooting Lists". In 1934, Ivan Nosov appeared in a photo in Pravda, gazing rapt as his friend Joseph Stalin addressed the 17th Party Congress. In 1937, Stalin scribbled “za” (“I approve”) on a list condemning Nosov to death. Nosov is one of 44,500 names that appear in “Stalin's Shooting Lists,” a disk issued last month by the human rights organization Memorial. The disk was complemented by the Polish and French release of “La Grande Terreur,” an album of arrest shots from the archives of Memorial and the State Archive of the Russian Federation. The releases were overshadowed last week by several searches of Memorial's office by Russian prosecutors, part of a crackdown on NGOs that has affected Human Rights Watch, Moscow Helsinki Group and hundreds of other organizations. Around 720,000 people were shot during Stalin's purges of 1937 and 1938. Many were simply tried and summarily executed by "troikas" (closed military tribunals) or other bodies run by the secret police. But around 44,000 had their sentences personally approved by Stalin and his closest henchmen. Stalin's initials, scribbled in bright red pencil, appear on 357 lists. “For any normal person, this proves beyond the shadow of a doubt that Stalin knew,” said project director Yan Rachinsky. 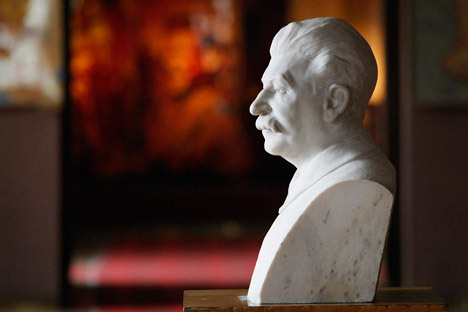 “Stalin's Shooting Lists” is an updated version of a collection first released by Memorial, in conjunction with the Presidential Archive, in 2002. The new disk features corrections, additions and scans of all 4,000 documents in the files, which are now located in RGASPI (the Russian State Archive of Social-Political History). Most of them date from between Feb. 27, 1937 and Sep. 29, 1938 - the height of the purges. The lists were prepared by local branches of the NKVD, then sent to Moscow and compiled for review by the NKVD, Prosecutor General Andrei Vyshinsky and the Military Collegium of the Supreme Court. Each file was to contain witness testimony, along with a biography and other case records (a bureaucratic nicety that was generally skipped as the Terror grew). They contained the names of former White Guard members and other rivals to the Bolsheviks, as well as cultural figures, technical specialists and military elites. But ordinary workers also wound up under Stalin's pen: Alexei Zheltikov, who was shot in 1937, was a metro mechanic. Zheltikov is among the faces from the lists that appear in “La Grande Terreur,” assembled by Polish photographer and historian Tomasz Kizny. Expressions in the arrest photos vary widely, from the cocked head and sneer of Ivan Chaliyev, a kolkhoz carpenter, to the wide-eyed fear of Vasily Vasilyev, head of security at the Kremlin. “They're like actors onstage,” Memorial head librarian Boris Belenkin said as he leafed through the album's pages. The most frequent autograph on the lists was that of Stalin, who always signed first. He was usually followed by close ally Vyacheslav Molotov, as well as Lazar Kaganovich, Andrei Andreyev, Kliment Voroshilov and Andrei Zhdanov. A handful of times, the lists also bear the names of Anastas Mikoyan and Stanislav Kosior, who himself was shot in 1939. Sometimes, they wrote comments. “I welcome it!” proclaimed Kaganovich on a list from Baku. Occasionally, Stalin underlined, crossed out or annotated the name of someone he knew personally. He wrote “hold off for now” by the name of Aven Yenukidze, a Georgian Old Bolshevik. Yenukidze simply reappeared on another list and was shot later that year. In a few instances, Stalin instructed for the sentence to be converted to 10 or 25 years in the Gulag. Marat Nosov was nine years old on the night when a car pulled up to arrest his father. Ivan Nosov first met Stalin in Crimea, while serving as first secretary of the regional party, and rose to become a Central Committee member. In Moscow, Nosov's family lived in the prestigious House on the Embankment. A 1935 photo shows him seated next to a group of leaders including Stalin, Molotov, Lavrenty Beria and Sergei Kirov. But one day in 1937, Nosov was criticized by Kaganovich. Soon after, Stalin called him into his office for a talk that lasted until morning. His wife, frantic, wrote Stalin a letter begging him to spare her husband. She received no response. Three days later, agents pulled up to their building, saying Nosov had been called to the Kremlin. “I lost my family because Stalin signed a piece of paper,” said Marat Nosov, now 84. Convicted of “sabotage,” Ivan Nosov was shot and buried in a mass grave in Donskoi Monastery. Soon after, his wife was sentenced to eight years in the Gulag and 10 years of exile. His son was sent to an orphanage. He encountered a series of documents his father signed under torture; on each one, his signature grew messier. He learned that Ivan Nosov's name was cleared on Stalin's orders in 1939, after Beria replaced Yezhov as head of the NKVD. (He was officially rehabilitated in 1955). Marat never knew that Stalin approved the killing, however, until he was contacted by Memorial. According to Rachinsky, one of the most challenging parts of the project was finding dates of death for the victims. The state often issued false records, as in the case of engineer Afanasy Firsov, creator of the BT-5 and BT-7 tanks (which served as the prototype for WWII's famed T-34). Many believed he died in confinement during the war, but the lists show that he was actually shot in 1937. After the Terror subsided, lists continued to be used to a lesser degree until Stalin's death. Their existence was publicly revealed by Khrushchev in his “secret speech” of Feb. 1956. Rachinsky said that work remains to be done in tracking down information about the victims, as well as learning how lists were assembled on the local level. As the state's grip on Memorial tightens, research quietly goes on. “Everything's a mess right now,” Rachinsky said, walking down the hall.